Cafe culture here is just as varied as in the west. From old Lâm Cafe to new coffee shops with lavish couches for young couples on a date. Many however are simply done in peoples houses, which they furnish with a few plastic stools and open to the public. In such operations the costs are very low as it’s usually family members who work there or employees from the countryside who are paid a pittance. According to Hoang, though, these operations rarely make much money. “If you want to be a success in your coffee business. You have to have something special. Maybe about quality, maybe about atmosphere. Maybe about you. 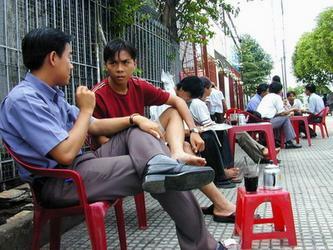 You are friendly and they want to see you.” Surely Hoang is a friendly man who had to excuse himself several times during the interview to make small talk with his patrons.